Welcome to your pop chord boot camp! This 17-minute lesson takes the most popular chord progression of all time and helps you to gain confidence by playing it in different ways! You will explore reordering the chords as well as using inversions to help you move smoothly (or not so smoothly) between the chords. So many of my students come to me asking for fresh new ways to play their chords and progression to make them more interesting and help them get out of a rut. This boot camp does just that by presenting you with different inversion and chord combinations as well as different ways to play them! This lesson is a win-win-win. How often can you say that?! You are working on a chord progression that shows up in thousands of songs, you are developing keyboard familiarity and dexterity and training your ear to connect to the ways inversions change the way we hear the chords we play. This lesson is presented in a boot camp style. This means that I want you to play along WITH me as you watch. I’ll talk you through all the chord changes and walk you through each change so you know what is happening and why it sounds the way it does. Work this video into your weekly practice routine and repeat it often until you can play along with me with a smile. Seventh chords are some of my absolute favorite chords on the piano. But they never used to be. Actually, they used to confuse me so much, that I would run for the hills when I saw a 7 on a chord chart. I avoided them, and because of that, I missed out of creating some of the most BEAUTIFUL sounds you can make on a piano. The reason I ran was that 7ths are confusing. There is no ONE version of a 7th chord. There are several different variations, and they all have different notations. But it doesn’t have to be confusing, and it actually makes sense when you stop and think about what the notations mean. So today I am going to teach you the most commonly used 7th variations, and how to make them. I’ll use the key of C here to keep things simple, but I’d encourage you to try these out in a bunch of different keys! 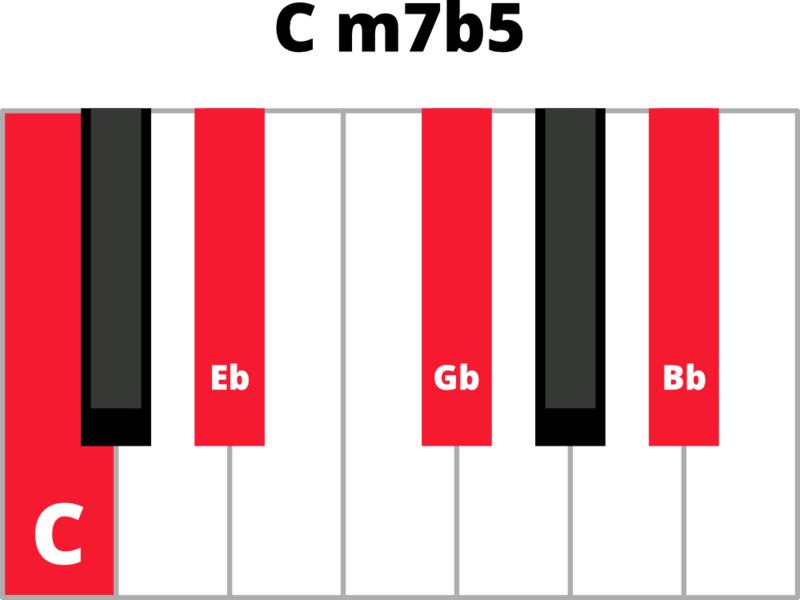 This is probably the most commonly used 7th chord in music. It’s extremely popular in blues and pop music. In fact, it’s so popular that in music notation it is just written as the number 7. This is what I found most confusing!! What is the difference between a Major 7th and a 7th? 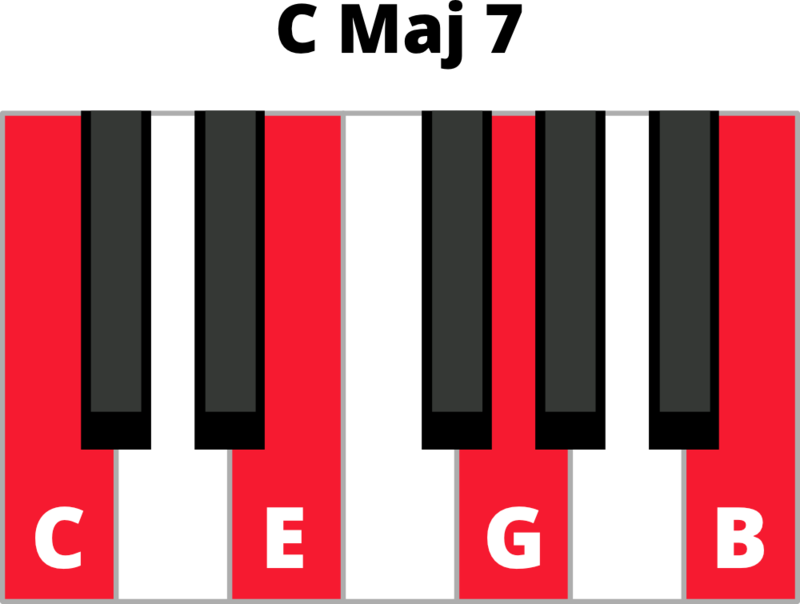 The name of the chord is the dominant 7th. Now why it’s called the dominant 7th is a lesson for another day (it’s kind of complicated), but making the chord is simple. So it’s not just major chords that can have 7ths. Minor chords can have them too! And a minor 7th is the same principle as the major 7th. You just take a minor chord and then add the 7th note of the minor scale. Remember earlier how I said I would run for the hills whenever I saw 7ths on a chord chart? Well, this one had me running for Mt Everest!! What the heck is a diminished 7? Now I know what you’re thinking. How the heck is A the 7th of C?! But remember, we are stacking minor thirds. So a minor third above C is Eb. 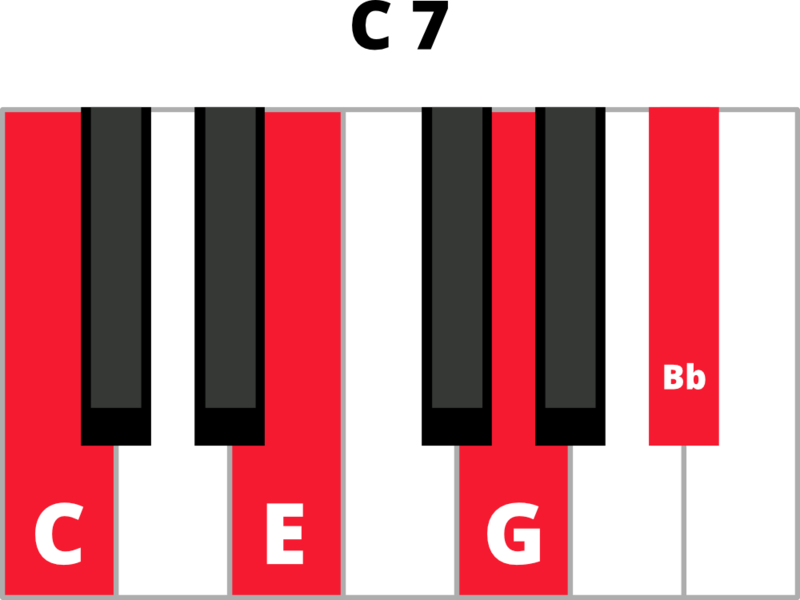 A minor third above Eb is Gb, and a minor third above Gb is A. This 7th chord is awesome. It is so villainous and suspenseful! The notation for this chord looks like some sort of secret code that would require a genius to break. But it’s even simpler than the diminished 7. 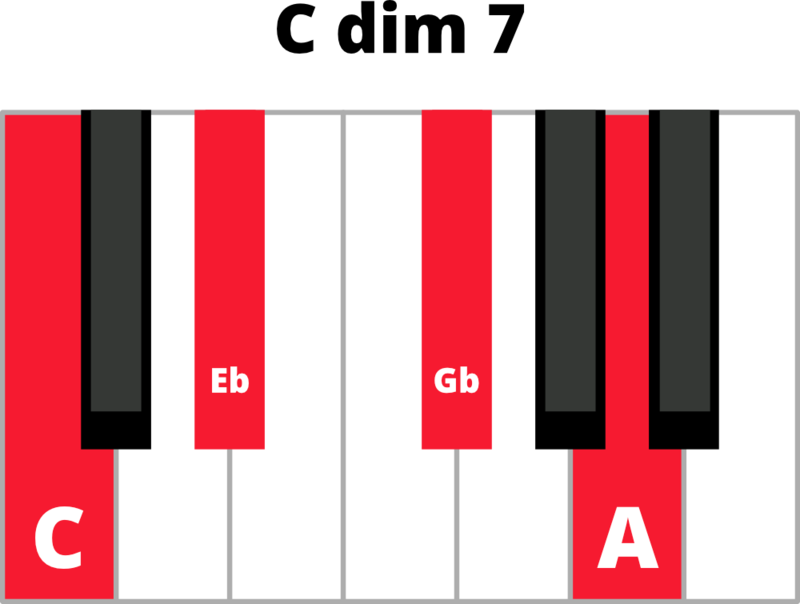 To make this chord we start with a minor 7th, and then flatten the 5th note. That means we just lower the 5th note by one half-step. So remember the C min 7 had C-Eb-G-Bb? 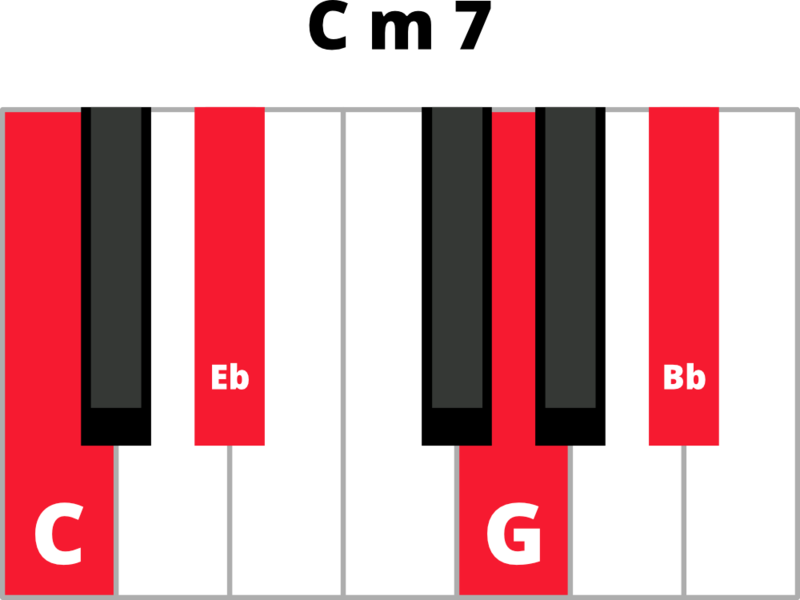 Well, we take that chord and then drop the 5th note (the G) by one half-step. So it becomes Gb. And that is how we can understand what 7ths are and how they are made! Hopefully, they’re not as scary anymore. And now you know how to make them, I really encourage you to try and use them in your playing. They can really add so much texture and emotion to your playing. Improvisation on the piano can be one of the most freeing experiences for a player. To be able to sit down at the keyboard and just …. play. I find it one of the most powerful forms of self-expression because everything that I play is coming from within. It’s not music written by anyone else. It’s just me. Really good pianists are able to hear a melody or tune in their head, and then transfer that to the keys instantly. That’s the goal, a true mind/body connection where your fingers are able to express what you are hearing or feeling inside. But it’s not easy! I’ll be the first to admit that. It takes a lot of practice. One of the best ways to practice is by simply sitting down at the piano, and experimenting with different intervals. In this lesson, Jordan shows us how to play around with intervals to see how they sound, and more importantly, how they ‘feel’. Each interval has its own characteristic. Its own identity, if you will. An important point that Jordan makes is to limit what you are listening out for. You’ll notice in this lesson he is only using the first five notes of the C major and minor scales, anchored around the perfect fifth in the left hand. We’re not trying to learn every interval at once. We are taking a few intervals, and noticing what they sound like in the context of chords and melodies. This is an unstructured practice. But it really gives you the freedom to learn. Because there are no mistakes. There are no time signatures to worry about. It’s just you and the piano. And for me, those are some of the best practices I’ve ever had.